A gunpowder tea that looks and smells like potpourri … a unique sensory delight! This gunpowder tea will leave you hooked – it’s absolutely divine! 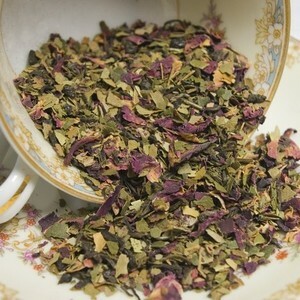 Potpourri Tea is from LiberTEAS – both the person and the co-founder of this blog! She was so nice to send me a tin of this. I remember having it before and liking it. It’s a VERY beautiful and interesting tea! The aroma of the dry blend is ‘pretty’ and then once you add the hot water to infuse it’s much more intense! It smells JUST LIKE potpourri and certainly lives up to it’s name! It made me feel like I was walking thru a glorious flower garden! The taste is light yet flavorful and floral and semi sweet at the end of the sip. It’s a very Feminine tea. Nice. Relaxing…but I do think that men would enjoy it too at the end of a day or if you are stressed and need a break earlier on. The aftertaste was pleasant and my palate was very pleased. I could taste the gunpowder but also the flowers without it being too much floral! I would ALSO suggest this tea to people who are not sure about gunpowder teas or don’t like the after taste of them…with the other ingredients in this blend – it doesn’t leave that stereotypical gunpowder aftertaste but the gunpowder is still present and you can still receive the benefits of the gunpowder! You can find some great info on Gunpowder Tea HERE. I want to thank LiberTEAS again for this sample! It’s truly lovely! NOW…here is a chance for YOU to win a sample of this too! CHECK IT OUT!!!!! CONTEST ANNOUNCEMENT: Win a 2 oz. Tin of Potpourri PLUS a 2 oz. Tin of Tea of YOUR CHOICE from LiberTEAS! (Limited to stock on hand) To enter, you need to comment on this review post. That’s it! We will select the winner via random selection on Sunday, July 11. 1. Become a fan on our Facebook page. Check out our sidebar widget to link to our Facebook page, and when you become a fan, come back here and comment on this post to let us know that you’ve become a fan so that you’ll get the extra entry. 2. While you’re on Facebook, go ahead and announce the contest on your Facebook page, and include a link to our blog in your comment. This will count as an additional entry, just be sure to come back here and let us know that you’ve posted the announcement. 3. Twitter about the contest and include a link to our blog in your twitter. Be sure to let us know that you’ve twittered about the contest by posting the information here. That’s up to THREE additional entries! Good luck to all of you! CONGRATULATIONS TO OUR WINNER: AmazonV! Enjoy your tea! That sounds like a delicious tea. Thanks for this giveaway and for the link to more info on the health benefits of gunpowder tea. Oohh, I can’t pass up this opportunity. You gals rock! Oh thank you for running this contest! That tea looks delicious, sign me up! Ooh, a contest! This tea does sound interesting. I’m still looking for my perfect floral tea, one that doesn’t taste like grandma’s perfume. WOW, this tea sounds fabulous! I am a new convert to green teas and have never tried a gunpowder one, but this sounds divine! Ooh! I missed the last SororiTEA Sisters tea contest deadline. Unfortunately, I don’t Facebook and Twitter has prolly closed my account due to lack of use. AANND…We are now Facebook friends! YAY! Wow, I would love to win some tea! Sounds likes a very lovely tea. Glad to see you are still involved with tea. Joined on Facebook too. I hope I’m not too late to enter, that tea sounds great! I’ve tried tea that Anne has sent to me before and they were great tasting. I just last night ordered some more before they are all gone. Enter me please in contest.